In the first week of 2010, five US soldiers were killed in Afghanistan. The last week of 2009 saw the deaths of eight CIA agents there. Several more Afghan civilians were killed during this period, including the apparent executions of several young boys by persons either in the US military or working with them. In addition, insurgent forces targeted a Karzai government in official in eastern Khost and launched rockets at the site of a future US consulate in Herat. It was reported on January 6, 2010 that the Obama administration was sending 1,000 more US civilian experts to the country to help in so-called reconstruction projects. This news was greeted with skepticism from Afghans both in and out of the government. The Afghan ambassador to the United Nations noted that few Afghans trusted these so-called reconstruction endeavors and that the US might do better if they hired Afghans to do the rebuilding instead of shipping in US citizens to "create parallel structures that would ruin (the Afghan government's) efforts." The ambassador must be quite aware that the history of US reconstruction in either Afghanistan or Iraqis is a legacy of corruption, poor construction and failed endeavors that benefited no one but the foreign companies that garnered the contracts. Despite the aforementioned situation and the eight years of comparable failure that preceded the weeks described above, the Obama administration is sending at least 30,000 more US troops into the Afghan fray. In addition, there will be an untold number of mercenaries added to the numbers of occupying troops. Like his imperial predecessors in Washington, London and Russia, Barack Obama is convinced that his army can somehow shape Afghanistan into a nation that will do the bidding of the empire he leads. 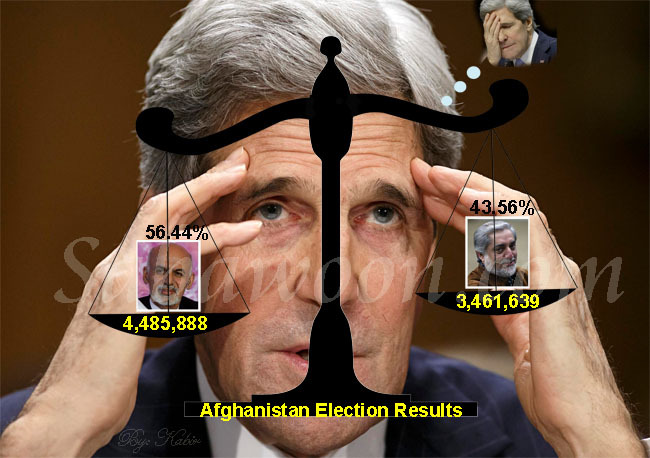 As the authors of Afghanistan: The Untold Story make clear, his chances for success are slim. History is not on his side. This book, published soon after Barack Obama's election in 2008, is a look at Afghanistan's history with an emphasis on the past one hundred years or so. The nature of Afghanistan's place in regional and international struggles for power and control in Central Asia are the primary subjects. From Alexander the Great to Barack Obama and General McChrystal, Afghanistan has spelled frustration and in every case so far, it has also meant defeat for the invader. The authors, journalists Paul Fitzgerald and Elizabeth Gould, present the reader with the details of Great Britain's perennial failure to subdue the armies of Afghanistan no matter who was ruling that nation. According to Fitzgerald and Gould, the primary reason for this was the debate over the Pashtun dominated areas(Pashtunistan) that were claimed by Britain under the Durand agreement yet were considered by Afghan nationalists to be part of Afghanistan. Even as it was losing its empire, London ensured a continued struggle over these lands and people when they created Pakistan out of the Indian subcontinent and split Pashtunistan in two. After World War Two the United States moved into Great Britain's former colonies, forming defense and economic pacts in its desire to encircle the Soviet Union. Like Great Britain before it, Washington's interactions with Afghanistan exhibited an ignorance of Afghanistan's historical desire for non-alignment. This ignorance was combined with an insistence that any expression of that desire proved that Moscow was influencing Kabul's politics. Fitzgerald and Gould write that this was not an accident. In fact, it was the logical outcome of a 1950 national security directive known as NSC 68. This directive, written by the anti-communist and militarist wing of the US foreign policy establishment, insisted that the Soviet Union was intent on establishing world hegemony and that the only way to defeat this was for the US to do so first. The essence of the philosophy motivating this directive was simple: one was either on the side of Washington or one was the enemy. The direct result of this directive was the creation of a permanent war economy and the creation of a national security state. In practice, some of what this meant was that national liberation struggles and national desires for non-alignment were perceived to be Soviet-inspired and terefore part of the enemy camp. Furthermore, US residents who opposed the policies of the US were considered to be potentially traitorous. In the Muslim world this view led to the beginnings of Washington's courting of the Islamic right. A fundamental reason for this alliance was the Islamic right's hatred of Marxist philosophy. In addition, certain US powerbrokers, like William Casey of the CIA, considered the Islamic right to be their spiritual brethren, at best ignoring their misogynist and murderous methods and at worst tacitly endorsing those practices. The alliance began with the British MI5 and CIA's surreptitious assistance to elements of the early Muslim Brotherhood in its struggle against Egyptian nationalist Abdel Nasser and found its ultimate expression in the arming of the Afghan mujahedin under Carter and Reagan. The US involvement in Afghanistan that began under Jimmy Carter was not an accident. It was the result of a concerted effort by the US Right to regain its power in the wake of the US defeat in Vietnam. Led by neocons Zbiegniew Brzezinski and Richard Pipes and aided by liberals like Barney Frank and Paul Tsongas, this ultimately successful effort represented a resurgence of the pro-militarist wing of the policy establishment as the primary architect of US foreign policy. According tot he authors, what it meant for Afghanistan was that Washington "was (now) backing a class of mullahs and landowners that had been fighting any social reform for generations" and was involved in a "process that drove social evolution in Afghanistan back to the Stone Age." The mujahedin war and what followed destroyed the social progress made under previous Afghan governments. Women and girls were relegated to second-class status and fundamentalist intolerance became the order of the day. The history told within these covers is the story of an ancient nation whose intention in the past century or so has been the creation of a free and tolerant society. It is also a history of a nation whose geography has placed it in the middle of many a battle for control by greater powers intent on colonization. The struggle for tolerance and fairness has taken place under monarchies, socialist regimes, autocratic capitalist regimes and democracies. It is the authors' contention that this struggle erupted into a civil war when the US began arming warlords and reactionary religious forces in its war against the Soviets. The chaos that has occurred in the wake of this decision resulted in the destruction of the forces working in favor of modernity and the rise to power of the forces of reaction. At this point in time the chaos in Afghanistan has devolved into a battle among powerful warlords and the Taliban, with the US siding with various warlords in the fight against their progeny-the Taliban.This bookputs the responsibility for Afghanistan's desperate situation directly in the laps of US policymakers: the corruption of the Karzai government, the Taliban, the acid-in-girls-faces, the warlords, the heroin trade and so on. It also asks whether or not this was the intention of those policymakers all along. If there is a shortcoming to this text, it is not in the writing or the history, but in the implication that it is solely the neoconservative elements in the US power structure that are responsible for Afghanistan's recent past and current situation. One might go along with this implication if it weren't for the historical record. Every Congressional vote to fund US aggression in Afghanistan has been anything but close, while the US mainstream media has rarely if ever questioned the war or the reasons given for that war. Indeed, when Ronald Reagan was posing for photos with the mujahedin, they were hailed as freedom fighters in every mainstream outlet. The policy of the US in what is now termed the AfPak war is not a policy of the right or the liberals, but of most of the Washington establishment. The muted response to Barack Obama's recent escalation of it is but the latest evidence of this fact. Afghanistan:The Untold Story ends with a set of recommendations for Barack Obama. The first and the last of these recommendations are their essence. Number One is simple: stop killing Afghans. The last one is a little more complex. Fitzgerald and Gould recommend that the debate over the United States national identity be reopened. According to them, this debate was closed down on December 7, 1941 when the Japanese attacked Pearl Harbor and the national security state became ascendant. From where I sit today, it looks like Mr. Obama has considered neither of these recommendations. Indeed, his policies are essentially a continuation of the past. If one wants proof, I suggest they read Obama's speech justifying the escalation of the war in Afghanistan and the news stories regarding the ongoing killing of Afghan civilians by US forces.